Ben 10 Upgrade Match | Play Game Online & Free Download Love puzzles? Check out the latest ben 10 puzzle game – Ben 10 Upgrade Match! You must match the blocks having the same Ben 10 alien marked on them and score the highest. Remember the clock is ticking continuously! About Ben 10 Upgrade Match Game Ben 10 Upgrade Match is just like the candy crush of ben 10 games. Love puzzles? Check out the latest ben 10 puzzle game – Ben 10 Upgrade Match! You must match the blocks having the same Ben 10 alien marked on them and score the highest. Remember the clock is ticking continuously! Ben 10 Upgrade Match is just like the candy crush of ben 10 games. This game is going to test your observation skills and the ability to find patterns as fast as possible. It is a time-based game and the more blocks you match, the more you score. There are 25 blocks on the screen, each having the icon for any one of the upgraded ben 10 aliens like Heatblast, Diamondhead, Upgrade, Fourarms etc. All these blocks with aliens on them are movable by dragging or swiping. You can move them in any direction you want to make sure at least three blocks of same aliens line up consecutively. This can be achieved horizontally or vertically but not diagonally. If you succeed in matching a triplet, those blocks will disappear and the number will be added to your score. Also, the puzzle will arrange itself to fill the empty spaces and a number of new blocks will appear. Pro Tip: Try to align more than 3 similar blocks to gain more points in one go. To play Ben 10 Upgrade Match game, you will get a time limit of 60 seconds. So, you must arrange faster to score better. With a continuously ticking clock, you must match as many aliens you can to score highest. Good Luck!! 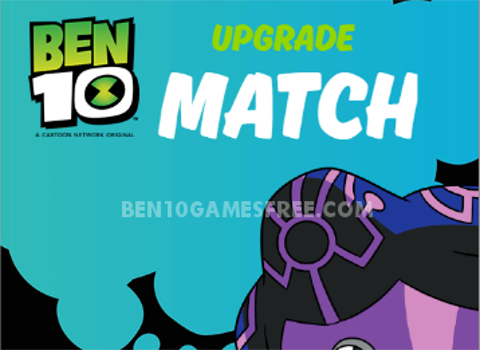 Don’t Forget to give your rating for Ben 10 Upgrade Match game and share your tips and tricks to win this game in the comments section below.